Do you feel comfortable starting conversations? Do you make small talk at social gatherings or business meetings? Whether you’re up for a promotion or looking for a new job, small talk can help create connections. Studies show the ability to converse with people is related to career success. Building rapport is a skill that requires practice. Don’t wait for someone to take interest in you. Take the first step. – Chat with one new person every day. Converse with everyone: cashiers, waiters, people in the grocery check line, and doctors’ waiting rooms. Accept invitations. – Prepare. Before an event review possible discussion topics. Skim your newspaper’s sports, business, and movie sections. – Be approachable.Act confident, comfortable.Don’t cross your arms. A smile, nod, and handshake are welcoming. Say “hello” first. Introduce yourself offering some information about yourself. – Start a conversation. Introducea topic of mutual interest or make a general comment about the weather or other. Unusual accessories such as a broach or favorite object on your desk can be conversation starters. – Listen.Focus on the person with whom you’re speaking. Pay attention, give feedback. Before entering into a conversation in progress, observe and listen. – Avoid personal, philosophical, political, and controversial topics.Maintain integrity, dignity, and optimism. – Exit a conversation graciously. When you feel the conversation is reaching a logical pause, say, ”I’ve enjoyed talking to you, but I don’t want to monopolize your time.” Exchange business cards if you want to know the person better. – Use small talk during business interviews. View the interviewer as a person. Show interest in the company, its future, and the job. Ask questions. Respond to conversational overtures. Connect with people regularly. Small talk is the starting point of all relationships and business deals. 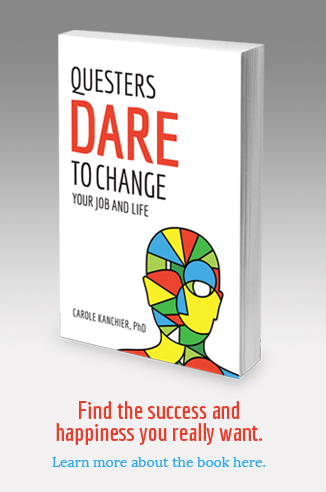 “Questers Dare to Change Your Job and Life” offers ideas and strategies for building career success. Dr. Carole Kanchier, career and personal growth expert, is a best selling internationally recognized author, educator, psychologist, and speaker. She inspires people to realize their potential, and look at career growth in new ways to succeed in changing times. Dr. Kanchier pioneered a unique, holistic, developmental model of lifelong learning, growth, and decision making which she shares in her award-winning, groundbreaking book, Questers Dare to Change Your Job and Life. Dr. Kanchier walks her talk!